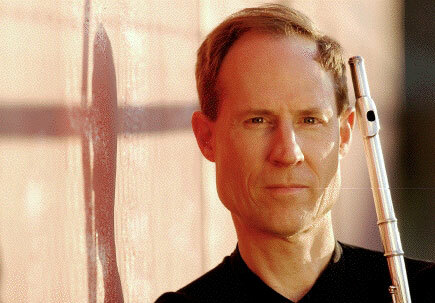 Leonard Garrison is Associate Professor of Flute and Aural Skills in the Lionel Hampton School of Music at the University of Idaho, flutist in The Northwest Wind Quintet, The Scott/Garrison Duo, and the IWO Flute Quartet, and Principal Flutist of the Walla Walla Symphony. A recipient of an Idaho Commission on the Arts Fellowship and a President's Mid-Career Award at the University of Idaho, he also teaches and performs at the Red Lodge Music Festival in Montana and Blue Lake Fine Arts Camp in Michigan. He has recorded critically acclaimed solo CDs for Albany Records, Capstone Records, and Centaur Records and been a soloist on National Public Radio's "Performance Today," winner of the 2003 Byron Hester Competition, concerto soloist on both flute and piccolo, and a frequent performer at National Flute Association conventions. Garrison has served as Chair of the Board of Directors of The National Flute Association and has also been the NFA's Treasurer and Secretary. Before moving to Idaho. he was Instructor of Flute at The University of Tulsa, Visiting Assistant Professor of Flute at Bowling Green State University in Ohio, and Assistant Professor of Music at the University of Arkansas and at the University of Wisconsin at Eau Claire. He has performed in the Chicago Symphony (including a 2003 tour of Japan), the Civic Orchestra of Chicago, the Tulsa Philharmonic and Tulsa Opera Orchestra, the Scotia Festival, and the Music Festival of Arkansas. The Flutist Quarterly and Flute Talk have published his articles. Leonard holds a Doctor of Music degree from Northwestern University, where he studied with Walfrid Kujala and Richard Graef. He received Master of Music and Master of Arts degrees from The State University of New York at Stony Brook, studying with Samuel Baron. His Bachelor of Music is from the The Oberlin Conservatory of Music, where his teacher was Robert Willoughby.